No other country can claim that it has such a deep connection with the rest of the country, as much as the small town of Tamilnadu. The machines here have dug deep well in most states of India (and also in many African countries). Thiruchengode is the Borvel Capital of the country and thousands of machines and operators go to the depth of 1,400 feet on any day, in most months of the year. In states like Maharashtra, monsoon has stopped their work, where in recent years they have done a lot of business. But, some parts of the country are also where it is still busy digging for water. Water crisis in Maharashtra - which is only highlighted in summer - In the first three months of this year (2013), thousands of borewells were dug only in Marathwada region. 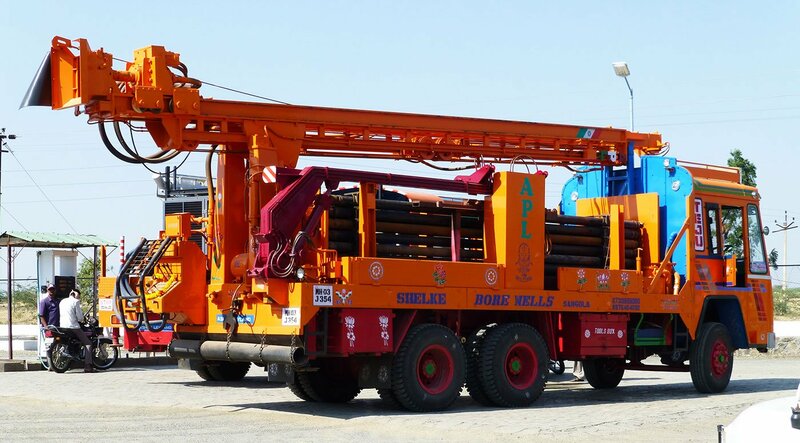 The borewell rig loaded on the truck was present everywhere in the fields. And the borewell itself in rural districts, if not water, was the biggest source of debt. All the rigs we saw while driving on the roads were all brought from Tamil Nadu. (Some were also from Andhra Pradesh.) A senior geologist from Maharashtra then told the Dahindu newspaper, "Most of them are known to bring only one town. And that town was Thiruchengode, which is in Namakkal district of Tamil Nadu. Shri Vayapuri of Sri Balamurugan Borwells told me in Tiruchengode, "I stayed in a village near Nanded in Maharashtra for four months this year." He is a dynamic, diligent rig operator. In these four months, this single operator dug about 500 wells in Maharashtra, most of the water deficient in Marathwada, Marathwada. He explains, "You can dig up to 1,300 feet in a day. If the soil is loose, digging can easily be done. This means that if the depth of the well is within 300 feet, then you can dig four wells in one day. But, if the soil was tough, then you can not dig more than 1,000 feet in a day. " Yhleksrwprthamdhindumen 28 Julai , 20l3 Koprkashithua.